Objective of this post is to load the data from all the files in a folder to a database of SQL Server via SSIS in SQL Server Business Intelligence Development Studio 2008 . 1. Create a new Package named “LoadData.dtsx” in BIDS 2008. 2. Create a new variable with name “FileName”. 3. 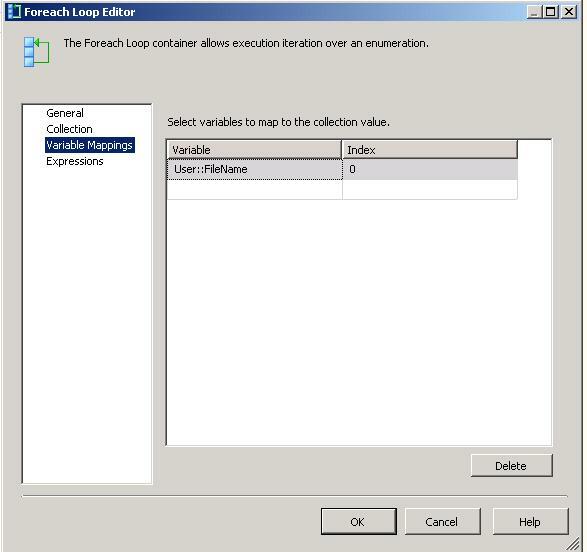 Drag and drop a “Foreach loop container” to SSIS designer. 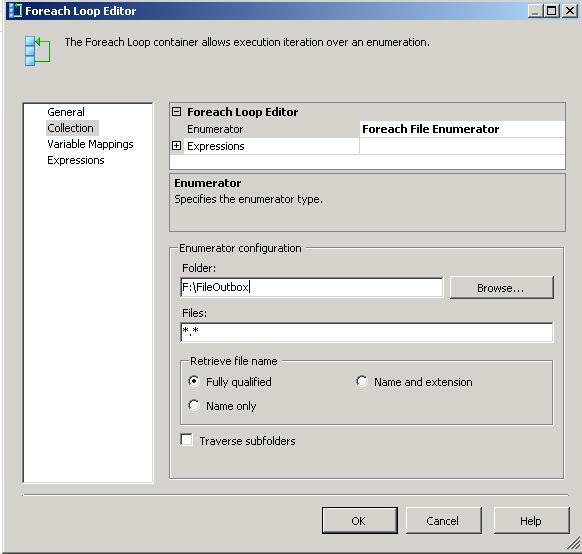 Set the Enumerator type and configuration settings as shown below. Set “variable mapping” as shown below. 4. Drag a data flow task on SSIS Designer. 6. On the Data Flow tab, drag and drop the “OLE DB Designation” from the Data Flow Designation in the Data Flow Tool Box. Create the new OLE DB Designation connection manager by clicking on “New” button on the OLE DB Designation Editor. 8. Run the Package from Solution explorer to see the output. 9. Package can be run by following c# code. This entry was posted on Saturday, September 18th, 2010 at 10:05 am and is filed under .Net 3.5 MS Studio 2008, .Net 4.0 MS Studio 2010, C#, SQL Server, SSIS. You can follow any responses to this entry through the RSS 2.0 feed. You can leave a response, or trackback from your own site.